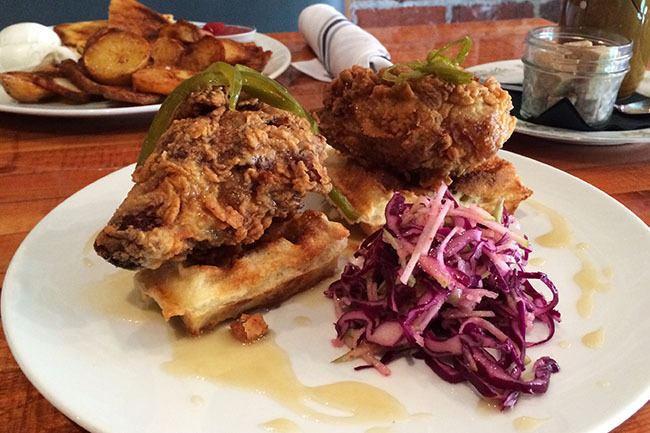 Fried chicken and waffles: a beloved combination of salty and sweet. Perfectly seasoned golden-battered chicken paired with crisp yet soft waffles and a sweet syrup ensure a soul-satisfying meal. You can find this Southern-inspired food staple on brunch, lunch, and sometimes even dinner menus across the city. 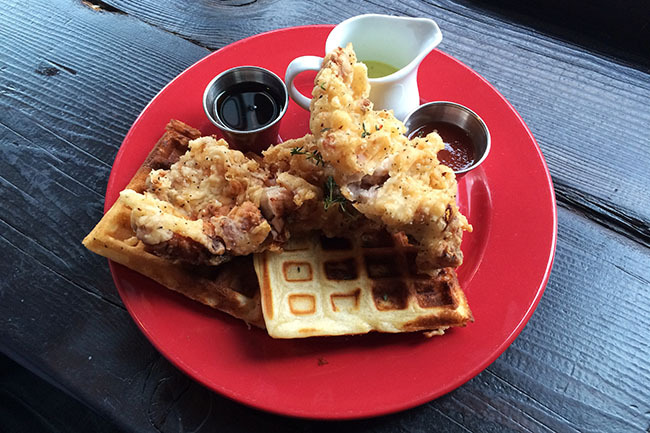 From highbrow establishments to hole-in-the-wall joints, here is a list of the best spots to tuck into deliciously indulgent fried chicken and waffles in Vancouver. 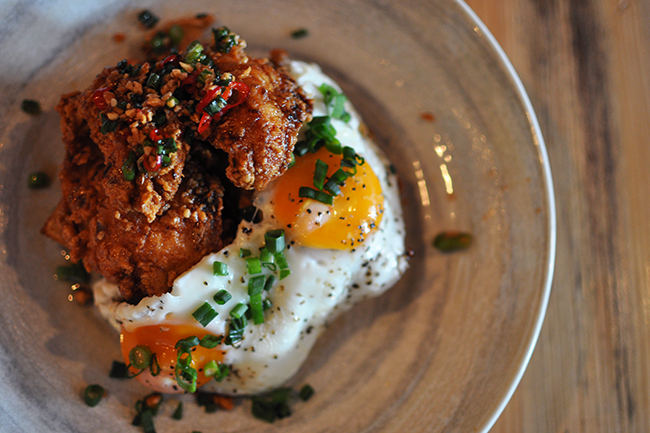 Bao Down Gastropub’s chicken, waffle, and egg combo is an absolute must-order, when brunching at the Olympic Village locale. Aptly named The Hot Stuff, Bao Down’s rendition of this indulgent dish is off the charts. 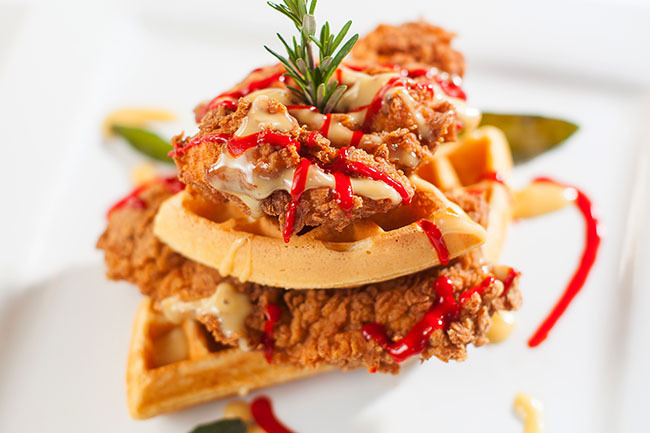 It is comprised of generous strips of addictively spicy fried chicken (it’s so spicy it will have you swiftly grabbing for a drink), crispy garlic, crisp waffles, and eggs, and is finished with a delightfully sweet macadamia syrup. 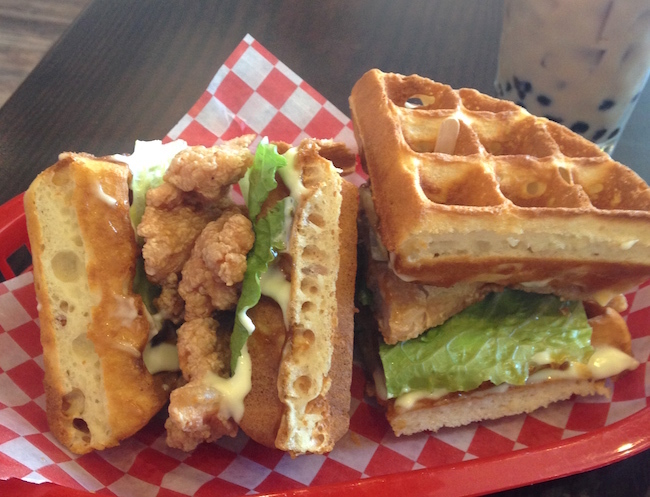 In addition to their perfectly cooked eggs, Yolk’s offers diners a mouthwatering chicken and waffles stack. 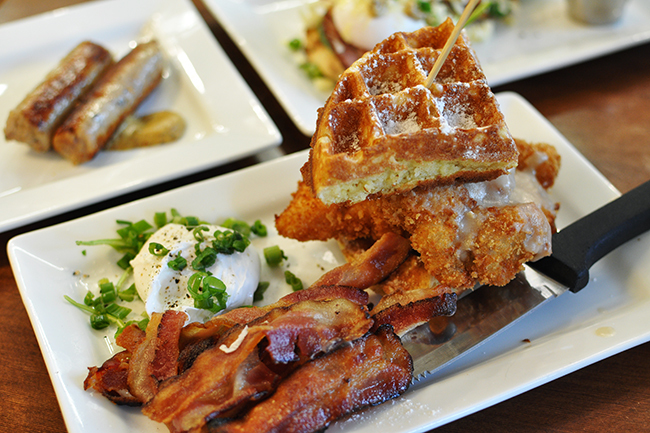 This towering plate is comprised of organic fried chicken, Belgian Waffles, chicken gravy, and maple syrup. With so much delicious sauce action going on, Yolk’s waffles never dry out. Diners wishing to go the whole hog can add-on a poached egg and some crispy bacon. It’s no wonder that Tuc Craft Kitchen’s Crispy Chicken and Waffles is a brunch crowd favourite. The dish, which consists of free-run chicken breast and two savoury waffles, is supremely juicy, delightfully seasoned, and matched perfectly with three accompanying potted sauces: Dijon Mournaise, maple syrup, and a house-made tomato chili reduction. Hailing from Victoria, the recently opened Jam Cafe on Beatty Street offers diners a wide range of delicious breakfast-inspired fare. 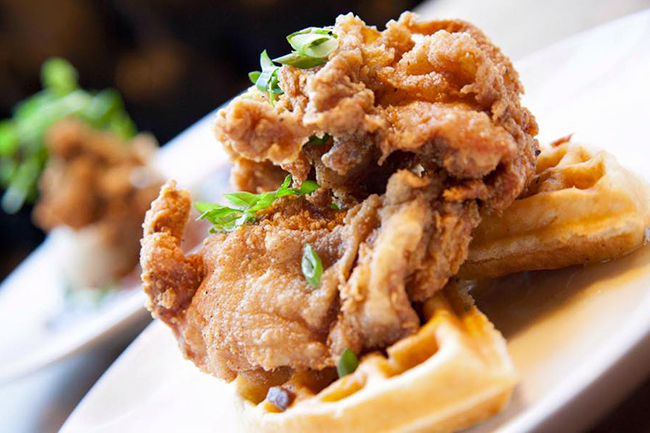 For a memorable meal dig into the eatery’s Chicken N’ Waffles, which is comprised of a single waffle topped with a boneless buttermilk fried chicken breast, house-made pork gravy, a sunny side egg, and green onions. 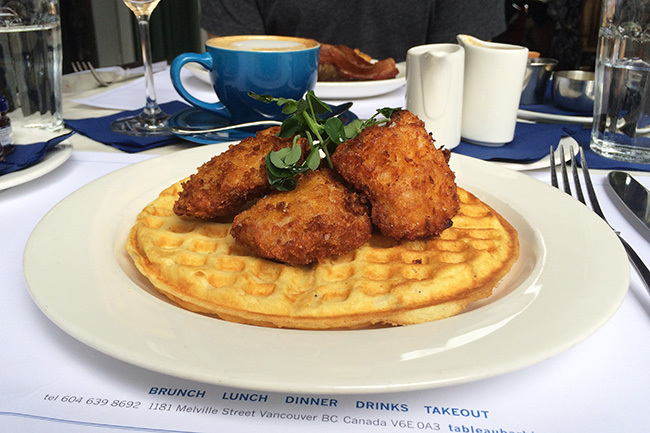 Yaletown’s WildTale Coastal Grill has recently launched a weekend brunch service. 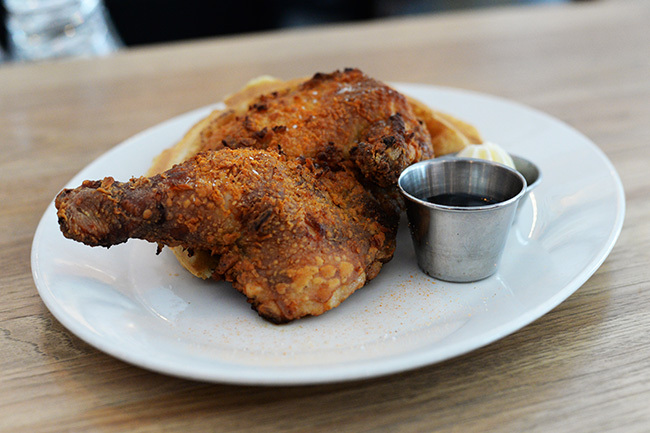 Alongside dishes that nod to coastal living, the eatery also serves up a moreish chicken and waffle rendition. The chicken is marinated for 24 hours in buttermilk, then dredged in flour, salt, pepper, and a little blackening spice, then flash fried and baked in the oven until golden brown. Comprised of tender buttermilk fried chicken strips and a light, golden waffle, Tableau’s take on this comfort-driven dish is mouthwateringly good. The chicken is crisp, moist, delightfully seasoned and matched perfectly with the dish’s two accompanying potted sauces, maple syrup and gravy, which when mixed together create the perfect sweet and savoury combo. Served with pickled jalapeños, red cabbage slaw, and drizzled in a sweet bourbon honey, Mamie Taylor’s version of this Southern comfort food is finger-lickin’ good! The chicken is crunchy to bite, moist on the inside, and wonderfully seasoned. Despite Mirua Restaurant & Bar’s recent rebranding, which saw the menu expand to include more refined pan-Asian eats, the eatery is still serving their sought-after and mouth-stretching fried chicken and waffle sandwich. Using their fluffy, mildly sweet signature waffles as bread, there’s a lot of fun and flavour packed in Miura’s “sando” creations. Vancouver’s iconic seafood grill and chop house Joe Fortes has become somewhat of an institution for weekend brunch. 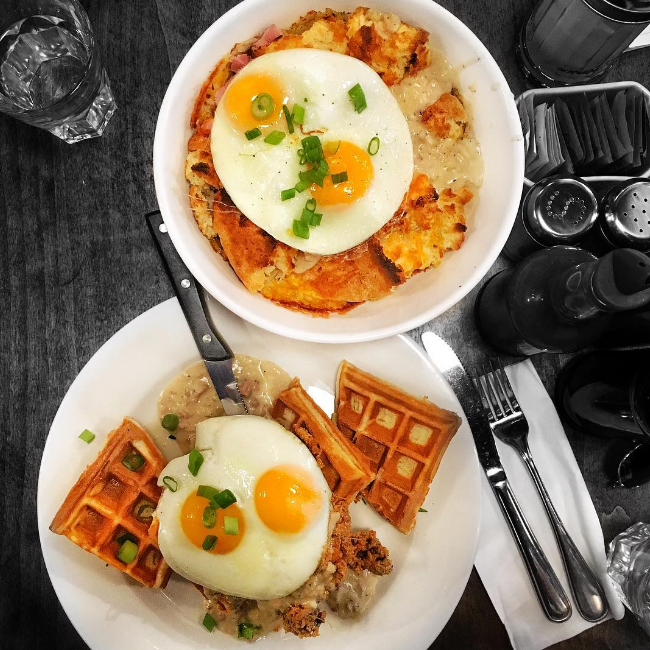 While patrons can choose between a variety of brunch time essentials, like Lobster Benedict and Steak and Eggs, they also have the choice to happily feast upon the restaurant’s signature Chicken and Waffles. Composed of buttermilk waffles, crispy coated chicken breast, maple brown butter, and a light chili glaze, this dish is gloriously gluttonous. At Chewies Steam and Oyster Bar, this Southern fried comfort classic is served atop fluffy buttermilk waffles and drizzled in a Cajun honey butter. With deliciously tender meat and a crunchy golden batter, Chewies’ fried chicken and waffles is one of the most popular items on the menu — and for good reason too!